There is a two and a half year old boy residing in this house who is rarely found without a football tucked under his arm. In fact, two of his first words were "football" and "touchdown" - his desire to speak/learn new words picked up when I finally found some books that matched his interests. So, I try to incorporate his favorite sport as often as I can into learning activities. He was THRILLED when I made him this NFL Memory Matching Game. Whenever we play, we not only work on matching skills and practicing the team name - but also review our colors, talk about the logos/patterns on the helmets, and even sometimes use our map to identify the state in which the team is located. 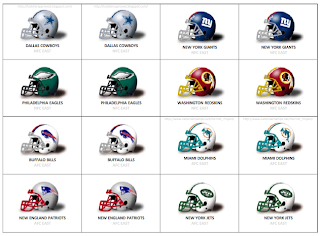 For now, using the full set (64 cards - including all 32 NFL teams) is a little overwhelming, so we usually break it down to a set of 12. Would you like to make your own? Click here to download the document. 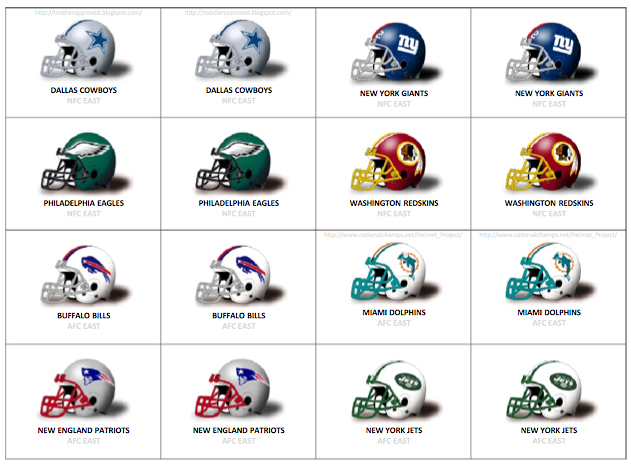 There are 4 pages of team helmets, and a 5th page meant for use as a decorative backside to the cards (if desired). I would recommend laminating these or printing them on cardstock, as they will get a lot of use. Also need to thank Mr. Charles Arey, creator of The Helmet Project, & artist behind each of the helmets used in this memory matching game, who graciously gave me permission to use his graphics, and share the game with you (for personal use only). Great idea! I'll be using these for our Superbowl party this weekend. Touchdown was also one of my 2yo early words.